It's been 11 months since my spine surgery. The first two months after surgery were rough, but my back is feeling much better. But can we talk about my feet? I wasn't surprised by plantar fasciitis and heel spurs in both feet. I went through the same thing in 2007. And yes, I know having surgery to fix those issues was my choice. But the rehab has not been fun. The peroneal and Achilles tendinopathy has been excruciating. 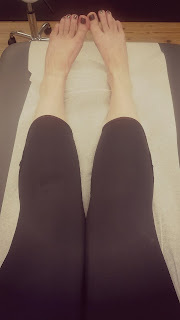 I have been going to physical therapy and doing my home exercises dutifully in the hopes that I will be able to go ahead with the second plantar fasciotomy/heel spur removal surgery sometime soon. 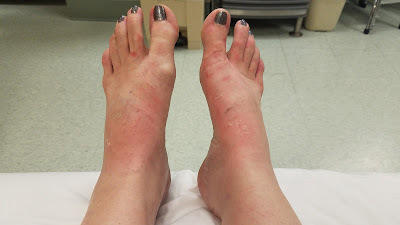 But I was really not prepared for having my feet run over by a LandRover at the DC Pride Parade (by a friend, he feels terrible, so please be kind). Universe, I feel a bit inundated. I feel like asking for 1 pain free day isn't too much to ask. And if you can't give me 1 pain free day, can we maybe start thinking about not adding on to what I'm already dealing with? I know there are people in the world that suffer more than I do. I know that there's no fairness as to who is dealt what hand. I'd just like to think that at this point the number of freak accidents that I've had, and the number of chronic issues that I've had qualify me for a bit of a reprieve. Universe, it's okay if you disagree. You've thrown a lot at me and I've survived. But can we try a different tack?